This incredible first-generation outside bonnet latch XKE, which is correct and proper, has recently completed its restoration to the highest standards of show-level correctness! It's not every day that a first generation E-Type is available to purchase, and has the early sought-after features like flat floors, welded louvers, and an outside bonnet latch. Our team was very excited about restoring such a rare, unique piece of Jaguar history, and especially to locate one with such a stunning original color combination of gunmetal and red. As marque specialists, we have performed a no expense spared, comprehensive restoration to this rare XKE to the highest Show level possible. Included in the restoration process, the vehicle has been completely dissembled, and the interior has been removed and documented, the body has been stripped to bare metal and placed on a rotisserie, the body has been body worked, metal finished, fitted, and leaded as needed, and all body parts and chrome were fitted to the E-type in bare metal; It has been primered, sealed, had a base coat and clear coat applied, and then color sanded and buffed to a beautiful finish. All body parts were painted off the car separately. All systems have been gone through and were restored, or replaced, as necessary. The transmission, clutch, and hydraulic systems were fully restored, or replaced, and the car has received all new rubber, grommets and seals. In addition, the britework has been fitted, and re-plated to Show level quality. The car received all new upholstery, and which has been fitted and installed in the correct materials by master upholsterers in our Upholstery Department. The roadster's parts and components have restored in the proper colors and finishes as well, and NOS parts were used wherever possible. Extreme attention to detail has being given because of the importance of this early, highly original E-type. 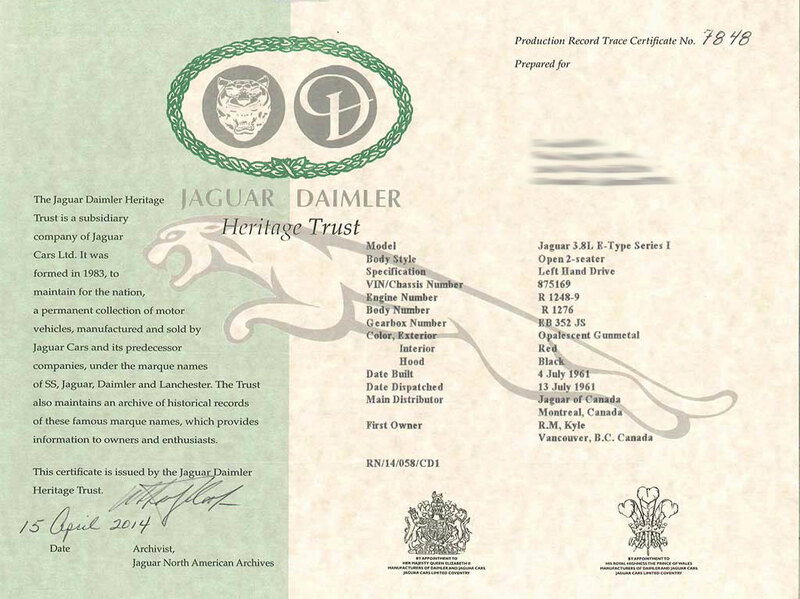 A DVD of the restoration process, along with a Heritage Certificate of Authenticity accompanies the vehicle. 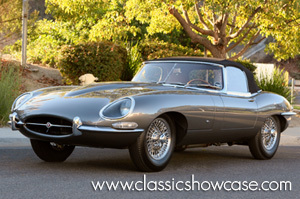 This is a striking original color combination that enhances the natural lines and beauty of this E-type. This first generation XKE is truly an amazing nut and bolt restoration, and is sure to cause a collector and enthusiast sensation at future Concours events; truly for the discerning Jaguar collector demanding the best! The Series 1 Jaguar XKE was introduced, initially for export only, in March 1961. The domestic market launch came four months later in July 1961. The cars at this time used the triple SU carbureted 3.8 liter 6-cylinder Jaguar XK6 engine from the XK150S. The first 300 cars built had flat floors and external hood (bonnet) latches. These cars are rare and more valuable. The outside bonnet latch is the most sought after of all the Series I E types. Only 500 external bonnet latch cars were made, of those, 385 were left-hand drive roadsters, 20 left hand drive coupes, 91 right hand drive roadsters, and 4 right-hand drive coupes. After that, the floors were dished to provide more leg room and the twin hood latches moved to inside the car.